Artist Drue Kataoka (www.Drue.Net) creates at the crossroads of art and technology. Born in Tokyo, she began her art training in Japan, graduated from Stanford University and is based in Silicon Valley. 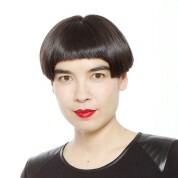 Her work spans disciplines, integrating ancient Japanese ink painting techniques with brainwaves, mirrors, time dilation, digital image processing and mobile technologies. In 2008, she exhibited at the first zero gravity art exhibit in space at the International Space Station. Kataoka has been named both a Cultural Leader and a ­Young Global Leader of the World Economic Forum, & had a solo exhibition at the WEF’s Annual Meeting in Davos. She has spoken at the WEF Annual Meeting in Davos (3 times) and at WEF meetings in Dalian, Yangon, Ulaanbaatar, and Geneva. She created the logo for the World Arts Forum. Her web/mobile installation TouchOurFuture.org was recently showcased at TEDWomen in Monterey. Her art has been featured on CNN, The Wall Street Journal, CNBC, CBS, ABC, FoxNews, NY1, Telemundo, Barrons, Wired, Blackbook, Flaunt, Gentry and others. She is a recipient of the annual Martin Luther King, Jr. Research & Education Institute Award & the Womensphere Global Award. After 9/11/01, she endowed the Drue Kataoka Art Scholarship for Youth (18 recipients to-date). Drue is a graduate of the Harvard Kennedy School Global Leadership & Public Policy Program and Yale University’s Foundations for Leadership Program at the Jackson Institute for Global Affairs. She is a co-founder of Aboomba (www.Aboomba.com), a fashion e-commerce and analytics platform. Drue sits on the board of the Djerassi Residents Artist Program, the oldest and largest artist residency on the West Coast. Investing in education is not about getting an immediate ROI, it's about touching the future beyond the horizon we can see. Great educators plant the seeds for towering trees that will stretch and shade generations into the future. I'm honored to be a part of the Academy of the Global Teacher's Prize.